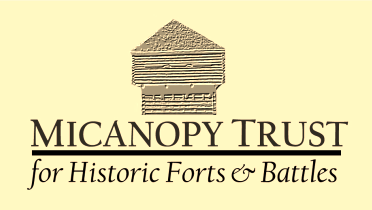 The mission of the Micanopy Trust is straightforward as well as ambitious. We believe we are well-positioned to attain our goals, including the ultimate designation of National Historic Landmark. The Trust maintains a close relationship with Gulf Archaeology Research Institute (Crystal River) and our board of directors include individuals with diverse backgrounds in business, the military, local government, museum operations, as well as academic history. C. S. Monaco, PhD, Founding President and acting Treasurer, author and historian, Courtesy Professor of History, University of Florida. Monica Fowler, Vice President, Micanopy Chamber of Commerce, President. Gary Ellis, Director, Gulf Archaeology Research Institute, Crystal River, Fl. Ed Crapo, Alachua County Property Appraiser, Gainesville, Fl. Major Richard Bustamante, Operations Officer, Army ROTC, University of Florida. Joe Aufmuth (ex officio) Commissioner, Town of Micanopy; Associate University Librarian, University of Florida Libraries. Tom Brady (ex officio) Planning and Historic Preservation Board, Town of Micanopy; 2nd Seminole War reenactor. Joe Knetsch, PhD, author and historian of the 2nd Seminole War. Max A. Nickerson, PhD, Curator (Herpetology), Florida Museum of Natural History, Gainesville, Fl. Les Singleton, Vicar, Episcopal Church of the Mediator; Vice President, Micanopy Chamber of Commerce. Mark Gregg, attorney; business owner and former Mayor of Islamorada, Fl.